I thought it would be fun to create some fabric acorns made with real acorn hats. So, we headed out on a family hike to gather some nuts like little squirrels. 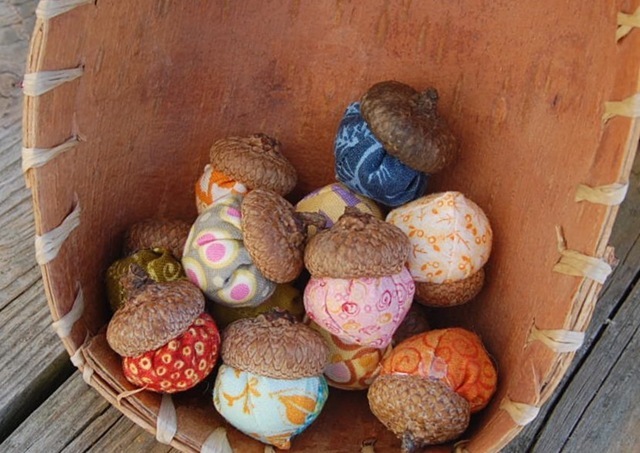 After we got home, we carefully pulled the tops off the acorns and I played around with some fabrics until I got the acorn-look I wanted. 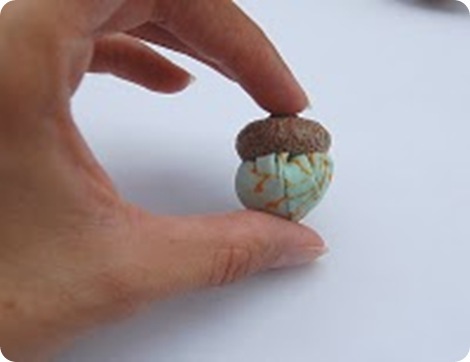 Here’s a quick little nature-inspired craft tutorial on how to make fabric acorns. I had fun making these, and I couldn’t make just one, my kids had fun helping me collect and choose fabrics, and my husband just thinks I’m nuts! Right now my acorns are being used as Nutkin’s snack. 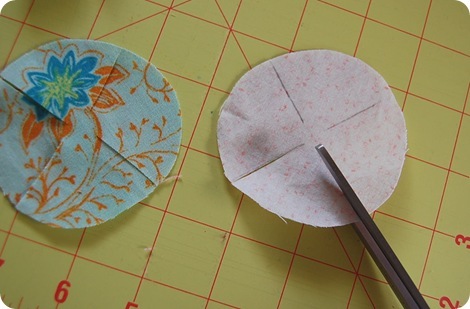 But I think they would make a very cute brooch or look fun in a bowl as a decoration for Autumn. 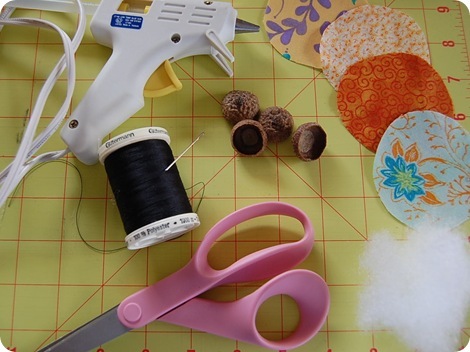 I am thinking of stringing a few and making an acorn garland. I would love to your nutty creations! Thanks so much for your wonderful Fall tutorial! Isn’t Sara super-creative?! You can find these great acorns in her Etsy shop…Zemphira! And Sara always has something beautiful on her blog. 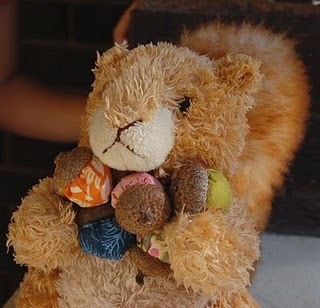 Would you like to win some of these fabulous acorns? 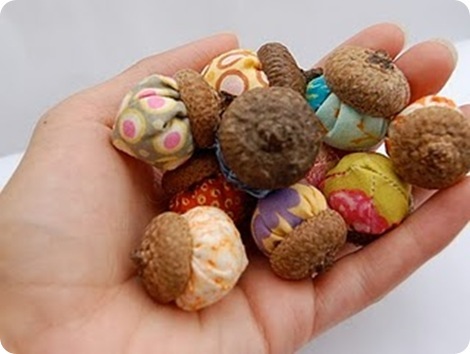 Sara will give one lucky Everything Etsy friend a dozen of these sweet little things and mail them to you in an acorn bag…who wouldn’t want these!? Please leave a comment for each entry. This giveaway ends 9/14 at midnight. ***This giveaway has ended. Thanks for all your wonderful comments on this tutorial! The lucky winner is Diana! Congratulations! The baby owl mobile – REALLY?!? Makes me WANT to have a baby just so I can hang it up! It is ADORABLE!!! Those are too cute! I’m going to have to look for some acorns now! .-= Tammy´s last blog ..I missed it! =-. Everything is so cute! And who wouldn’t love those acorns!! My favorite thing in her shop is the Colorful Baby Owl Mobile. The owls sitting on the twig branches are adorable and I think my (very grown up) 4 four year old granddaughter would love it on her wall!! Thanks for a super giveaway and tutorial! Oh, I love SO much in this shop! She really is a fantastic artist! I think my favorite is the Babushka doll fabric house! I love it! .-= Jingle´s last blog ..Alcohol Inks- oh- why have I waited so very long to find you WOYWW =-. Oh my, if these aren’t just the cutest things ever! Thanks for sharing them with us! .-= Diana Fisher´s last blog ..do not enter! nates room! =-. 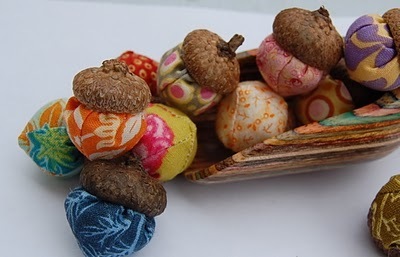 These acorns are so adorable! 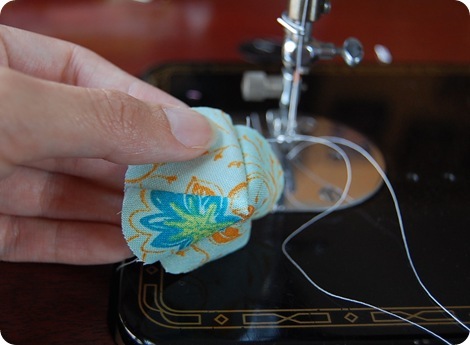 .-= Jessica/soulenergy´s last blog ..Tips for Successful Commenting and 7 Things to Avoid =-. Oh, I love the aprons. So many cute ones! Just lovely! OH MY HEART these would be SO PERFECT in my fall window display for the new shop. Thanks for the tutorial!!! I am already a big fan of Zemphira’s shop. I posted on my FB page and Tweeted! Such a sweet idea and so wonderfully executed. .-= Heidi´s last blog ..Giveaway WINNERS! =-. Such cute stuff! I love it! I am especially fond of the Halloween apron! Oh so cute!!! Love them, and your blog is great!!! .-= Jenny´s last blog ..Fixed my No Reply =-. 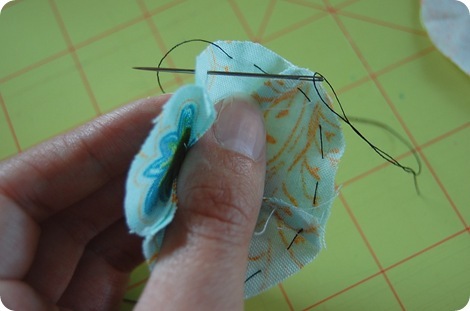 .-= Laura@HappyHomemakerUK.blogspot.com´s last blog ..Tutorial- How To Post A Blog Comment =-. .-= janet metzger´s last blog ..Ice Queen Neck Warmer with Shipping Included as Featured in Susantique Treasury West =-. Love the aprons! I’d love one with cupcakes on it! .-= Liz@HoosierHomemade´s last blog ..Caramel Apple S’Mores =-. My fav are the acorns. Love them. .-= Tammy K/ StitchnStudio´s last blog ..SALE Large Brown-Pink Butterfly Bookbag- PC- Back to shool Bag- Purse =-. Shared this tutorial on my blog. I love the Saturn the Orange Tiny Owl! .-= Wendy´s last blog ..Salt Springs =-. Oh my goodness! I am in love with those! I was walking around campus the other day with my 2yo and we were picking up acorns and admiring them. I wanted to keep them all! 😉 This is SO CUTE!!! 🙂 Thank you for sharing! .-= Diane´s last blog ..Custom Custom! Get your custom order today! =-. Oh goodenss Gracious!! LOVE LOVE Love everythign! I love the coffee sleevs and the change purses and all the fabrics…IF I had to choose one…it would be the small bird purse. 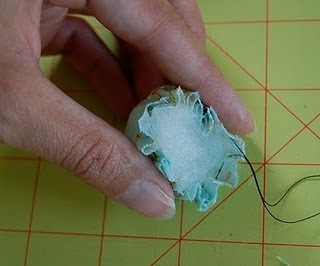 .-= Kathy´s last blog ..I made granite cleaner!! =-. I love the little red riding hood house decoration for a table or desk. Very cute. Thanks for the chance to win! Those acorns are too cute! But I must say I could put one of her fabric organizers to good use! .-= Prairie Wind Designs´s last blog ..The Light at the End of the Tunnel =-. Love these acorns – so cute – and her owl mobile is to die for!! 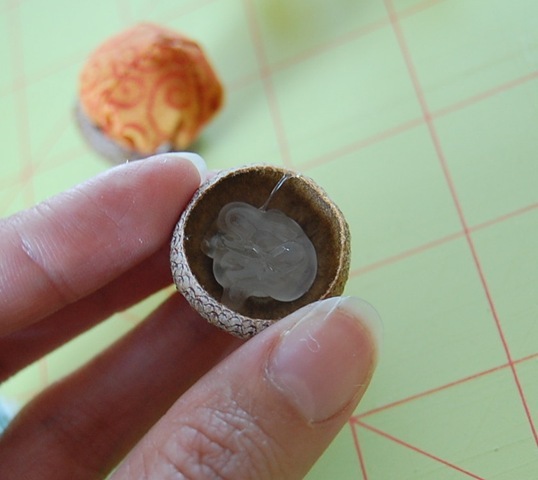 They are so cute,hey if I don’t win this ones I can always make some for me by this simple tutorial.Only must to find acorn hats first =o). Deer and Mushrooms Sweet Little Handbag,too bad she’s not give it away on of her bags.Oh,well,I do hope to win some of yours lovely giveaways. .-= Tom the DH´s last blog ..Countdown to Quilt Market! =-. On Zemphira’s Etsy’s Store, I really like the Bat Waist Apron. 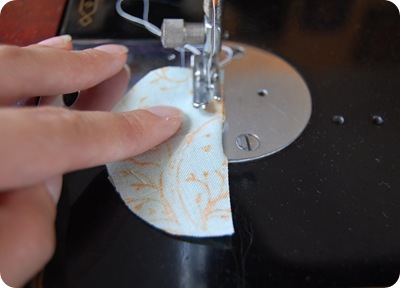 I like it because when the DW is cutting and sewing and “in the zone” it’s like a she’s in her own bat cave! I have to get that for her! Thank you for sharing this tutorial. I can’t wait to make one! I guess I have to go on a hike to collect some acorn tops too! .-= Susan Liu´s last blog ..My Favorite Cardidan =-. I especially love the acorns, but I also liked the owls and the pincusions! !